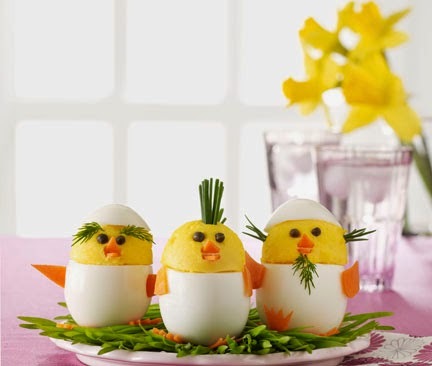 These Deviled Egg Chicks from the April issue of Woman's Day would be fun anytime you're serving children, but they are really perfect whoever you'll be entertaining this Easter -- young and old alike. These are insanely easy to make in just four easy steps. Just think how much your holiday guests will be impressed when they see your creative take on an old-fashioned food that has been enjoyed in Spring & Summer for generations. 1. Place the eggs in a large saucepan, add enough cold water to just cover and bring to a boil. Remove from heat, cover the pan and let stand for 11 minutes. 2. Drain the eggs and return them to the saucepan. Gently shake the pan to crack the eggs all over. Run under cold water to cool, then peel the eggs, discarding the shells. 3. Cut the top third off each egg and reserve. Carefully remove the yolks from the bottom two thirds, transfer to a small bowl and mash with the mayonnaise, lemon juice, mustard 1/4 tsp salt and 1/8 tsp pepper. If necessary, slice a thin piece off the bottom of each egg white so they stand straight. 4. Using a 1-inch cookie scoop, scoop the yolk mixture onto the top of each egg white. Very thinly slice the carrot into strips, then cut into feet, wings and beak shapes. Use the capers for eyes and the herbs for beards, hair, and eyebrows, gently placing each in the yolk mixture to make a face. Use the reserved top third of the egg for a hat. FTC Disclosure: Recipe and image provided by Woman's Day. I did not receive any payment or other compensation associated with this post. See complete FTC Disclosure information that appears at the bottom of MommyBlogExpert's home page and at the bottom of every individual post on this blog, including this one.